We are proud to be the gold sponsor of the 8th Edition Innovation and New Technology in Cash Management conference. This year’s edition of the event takes place on March 28-29 in Singapore. Visit our stand and talk to our experts. Cash management is more important than ever and transaction banking landscape is changing. There is a growing number of nonbanking players in the sector and banking professionals have to learn how to build successful partnerships with them. Every edition of the conference gathers key-decision makers in financial institutions. It is always a great opportunity to exchange views on major issues facing the sector and share their experience. The annual meeting is known for its multiple panel discussions and speeches. 8th Edition Innovation and New Technology in Cash Management is all about staying up to date with the latest developments around real-time payments. The conference watchword is “Leverage developments in real time payments and product development methodology to provide a superior customer experience in a disrupted environment “. Attendees will discover the use of AI, blockchain and data analytics in innovative cash management. What is more, do not forget that has been a lot of buzz around Customer Experience recently. CX is priority number one for many businesses. This is why we would like to kindly invite you to listen to our expert’s presentation. Dariusz Trocyszyn - Business Solution Consultant at Comarch is one of the conference speakers. Do you know how an innovative system can influence CX & EX? Can an internet platform increase loyalty? Are your clients and employees loyal? 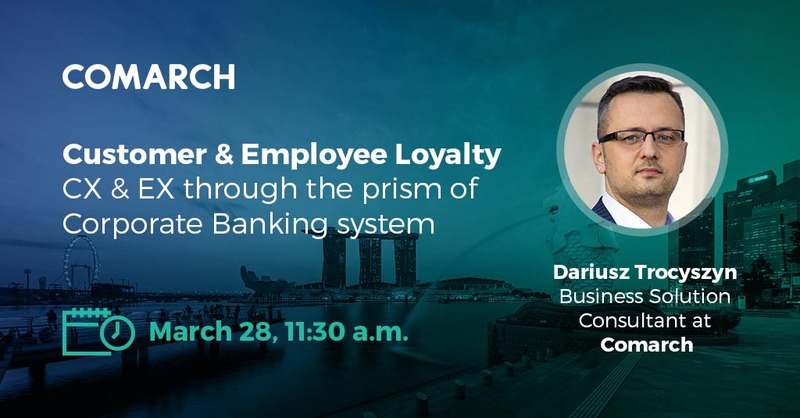 Mark your calendars for March 28, 11:30 am and do not miss his presentation entitled “CX & EX through the prism of Corporate Banking system”. We kindly invite you to visit our stand. Comarch delegates – Dariusz Trocyszyn, Krzysztof Maurer, Julia Sobolewska and Parida Leelaniramol will answer any questions you may have.